With both my age and locksmithing experience becoming more noticeably lengthy; though I could, I won’t take you too far back in time. When I started working for Eddie and Ted Aldridge in London back in 1978, the ‘Car Key Code Cutting’ concept was still medieval. 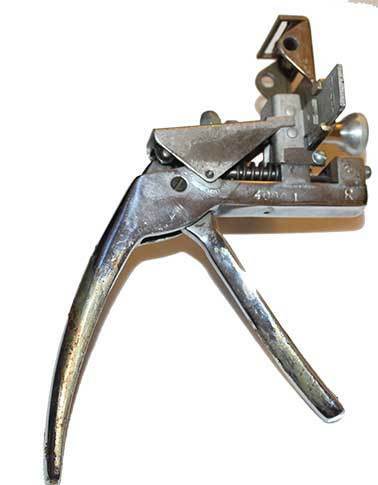 I remember trying to tailor a key machine, the Rekord, to code cutting using metal templates, but at this time it was still too complicated of a method to successfully execute. It was Curtis, a company based in Cleveland, Ohio that managed to pioneer this. Curtis was a company I professionally followed up until their acquisition by Barnes Distribution Group in the late nineties. It was since acquired by MSC (Manhattan Supplies Company) of New York in 2013. Back in the seventies a team of engineers at Curtis Inc. invented the ‘Curtis Key Clipper.’ This was a clever hand tool which allowed the cutting of car keys by code. The system was simple. Packed coding templates were inserted into the ‘gun’ and this provided the clipping tool which was much like a smaller version of a blanking die used in bigger presses. It was from the Curtis Clipper that the idea for the next revolution in code key cutting came. The CM 1200 Code Machine invented by Tom Swiderek, created by Nick Gartner of La Gard, California; manufactured by HPC of Schiller Park, Illinois and managed by one of the greatest entrepreneurs the industry has seen, Hoffman. The 1200 CM Machine, which I personally sold hundreds of around Europe, the Middle East, Africa, Asia, Australia and New Zealand, was a fantastic machine, because it worked on the principle that a simple plastic card would represent the spaces and depths of each key. This corresponded to that of a car lock. Once inserted onto a screen you would just have to turn the two wheels of the two axes, like in any professional tool machine, following the code information provided. Although the machine was a best seller in the 1980’s, an enormous amount of time was invested, by myself and my engineers, into collecting data on key codes from the world’s car manufacturers. This information was then put in books and on professionally printed cards to be used by professionals. In 1987 came the evolution of the ‘La Gard Card Concept.’ My father Camillo Bianchi and I were very much enticed by electronic technology, and our focus was on the idea of ‘funneling’ the encyclopedia of car code information we had collected into innovative computerised software – which had still to be invented.